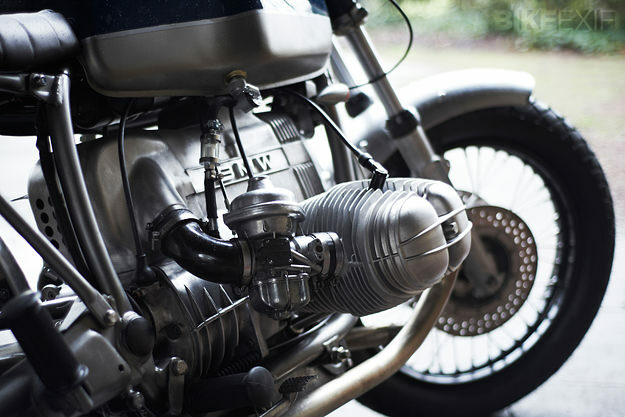 The BMW airhead revival continues apace. 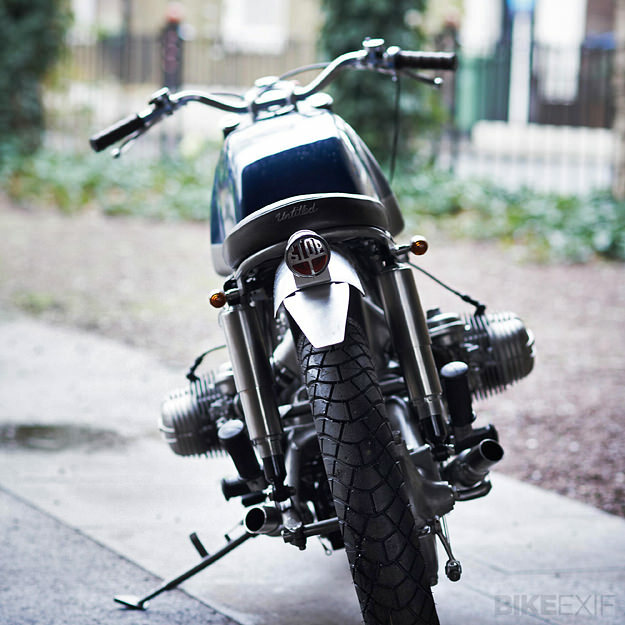 This stripped-back R100 RT comes from London’s Untitled Motorcycles and it just oozes vintage charm. It’s a classic barn find story. 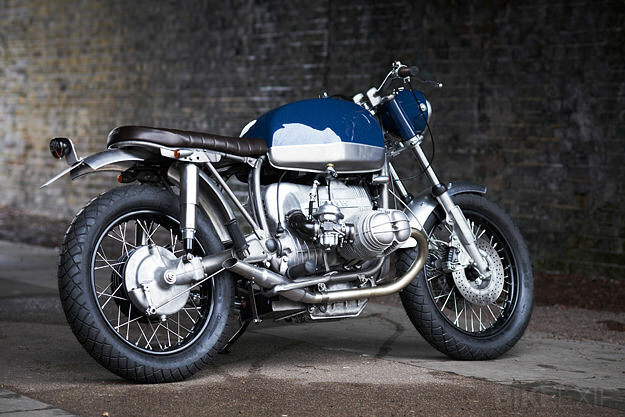 The BMW had been rotting away in a garage for years before Christian Smith saw it, bought it, and trailered it over to Untitled’s Camden Town workshop. “There are larger shops than Untitled, but I wanted a smaller and more personable company—where I felt like I was getting something unique and bespoke. And Adam and Hugo were very open to options,” Christian says. 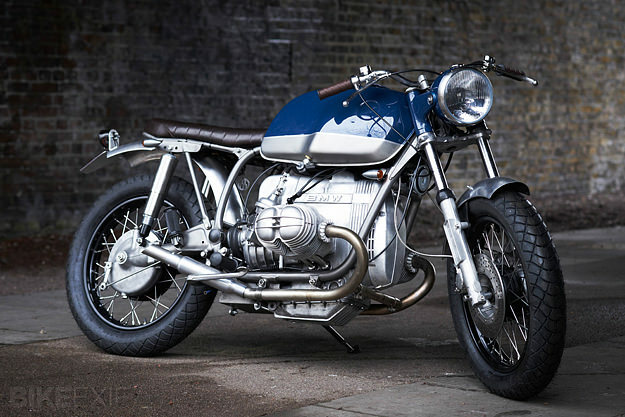 His brief was simple: create a raw-looking BMW with no frills. Untitled started by replacing the original forks with a pair from an R80 ST—which meant they could use 18” x 4” spoked rims. These were powdercoated black, laced up to contrasting stainless steel spokes, and shod with dual-sport Michelin M45 tires. New stainless steel fenders were hand-fabricated and sanded down for a grittier look. The tank, frame and swingarm were all de-lugged and sanded back to bare metal, and the subframe has been shortened by 15cm and re-welded with a raised hoop. Then Untitled powdercoated the frame in a clear satin finish from Armourtex. A custom brat-style seat in rich brown leather was hand-made by Glenn Moger. The contrasting gloss blue and brushed steel paint scheme reflects the bike’s dual on- and off-road nature. The top half of the R100 is painted and upholstered, while the bottom half (and engine) remains raw and functional. It’s a trick that also reduces the visual top-heaviness of the original bike. A 1960s Brit headlight, modified to incorporate the stock BMW speedometer and warning lights, is attached via brackets from an R75/5, with everything painted a glossy blue to match the tank. 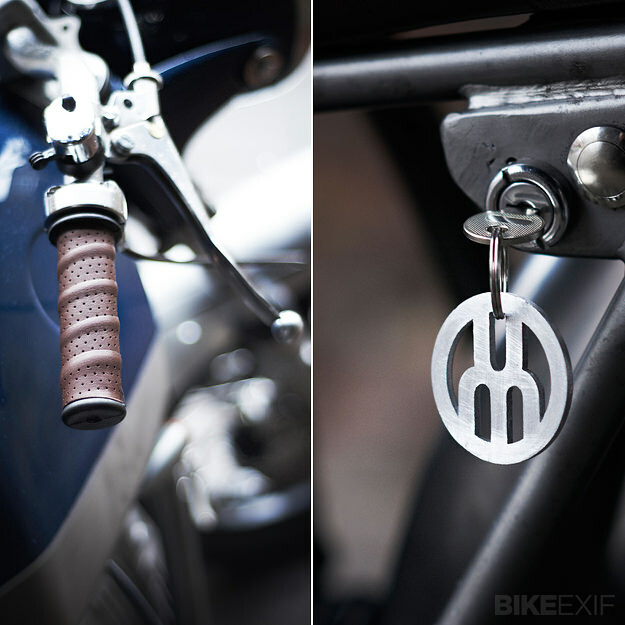 Brushed aluminum bullet indicators from Roy at Online Parts Shop attach to the frame to complete the look. The bike has been completely rewired by Untitled’s in-house electrics guru, Anita, with routing through scrambler-style handlebars to Brit switchgear and grips wrapped in Brooks leather. The ignition key and starter button have been re-positioned alongside the seat, the front brake reservoir is relocated under the fuel tank, and the battery is now hidden under the engine in a custom-made box. After three years of sitting idle, the engine required a complete overhaul by Rex with new big end shells, piston rings, timing chain, exhaust valves and clutch. The cylinder heads and barrels were blasted and re-polished and all bolts, nuts and washers were replaced with stainless steel throughout. The header pipes were chopped, the rear balance pipe removed, and twin stubby silencers welded on. The result is a considerably lightened and practical R-series with a split ‘town and country’ personality. And it perfectly matches Christian Smith’s real-world needs. 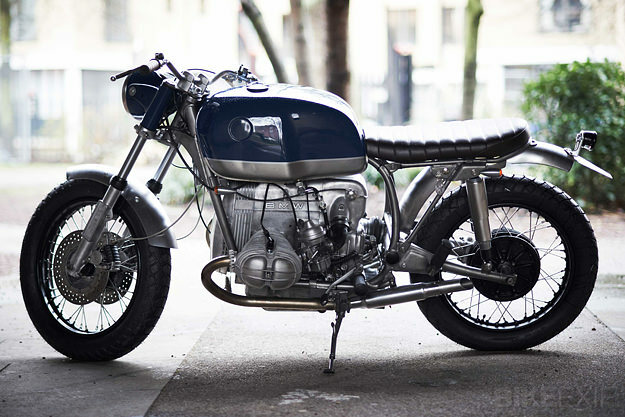 Visit the Untitled Motorcycles website to see more of their stylish builds. Images by Damian McFadden. And if you live in San Francisco, you’re in luck—Hugo is moving Stateside to set up an Untitled operation in California.